Bonnie is hosting the second annual Sheenazing blog awards and Kelly Thee Hilarious wrote a priceless roundup/smear campaign of some her nominations. Don't miss it. And most most most importantly ... please keep Bonnie's sweet James in your prayers! Janssen is letting me kick it (yes, I am 17 and footloose and fancy free and have plenty of time to "kick it" places ... ) over at her phenomenal blog today. She's started a really cool series where she interviews bloggers about their favorite and not-so-favorite books. I've been known to frantically text Janssen from the library for book recs and she ALWAYS delivers so .... go forth and get lost in her blog after you restrain yourself from judging me too hard for not being a fan of H. Pott. How is everyone feeling about the Bachelor this season? We are two episodes in and I'm not sure I've heard Johnboy string three sentences together in one sitting ... other than to gush about surprises. I thought I'd love him but ... he's even making personalityless Brad look more fun. Clare is AshLee reincarnate (AshLEY and I are in agreement over this which is why are we e-bffs) and there is no clear favorite in Grace's book quite yet. Ashley sums everything up so much better than I ever will. One thing on my longish list of things to do before the baby comes is to cobble together some sort of "gallery wall" in the living room even though I'm confident Theo could "curate" a better looking situation than I will. Don't you love the super necessary "quotation marks" they are "the best" ... "I know". Anyway, until I hunt and gather enough stuffs ... I'm happy to have Pinterest to make me feel super adequate in the decor department. I am forever grateful to Jenna for inspiring (not a word I use lightly) me to TRY embroidery to maybe mount in my future gallery if it doesn't look too terrible. I've watched all her vlog tutorials twice and I'll be back for more. Last week I had the pleasure of meeting up with blogger extraordinaire Audrey for lunch. She was so sweet and I had the best time and I'm scared to see her post any new photos because she might be earless after I talked and talked and talked and talked her ears right off her person. She just started a really helpful and practical series on starting and growing your blog and you're going to want to head right on over and start studying. 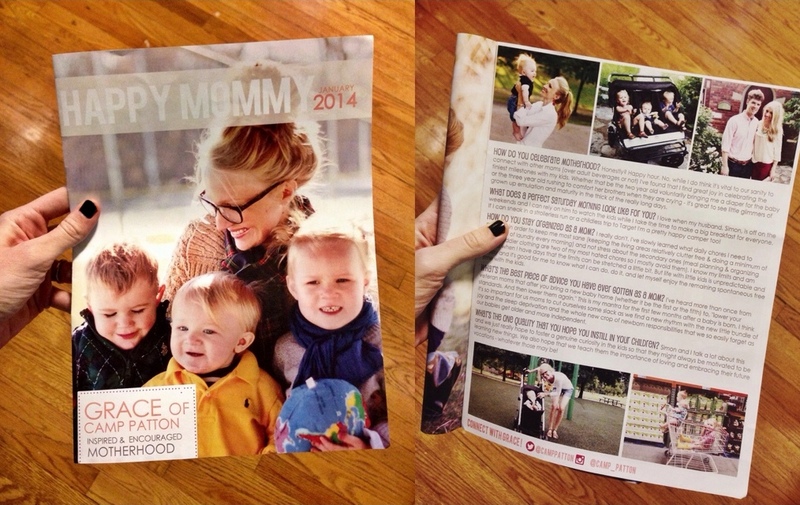 Happy Mommy Box was kind enough to have the campers on the cover this month. I think there is a waiting list to order the box (which is awesome because they just just recently launched!) but you should check it out. It's pretty genius. I went to college with Natalie and will totally pull the, "I knew her when .... " card when she strikes it huge(r). And now I think I'll take the charges for a drive while dreaming of busting the stroller out of hibernation in a few interminable months. Creative Mommy for the big dubya, always. Quotation marks--the hashtags of yesteryear. Fact. Other fact: your blog is great and I definitely nominated it in the Sheenazing Awards. HA. I love both of these facts the fact #2 is super undeserved. YES, Gone with the Wind! I read it after my dad told me not to in the sixth grade (what can I say ... rebellious) and I've reread it over and over again. It was only dethroned as my favorite book in college when I read The Count of Monte Cristo. Gallery wall was on my to do list, too. Now the babe is here, and I've just slapped a quilted pillow case on the wall. I think you will be more successful than I was. Congrats on Happy Mommy Box! I agree, Simon's photo would get two thumb up emojis. I loved Anne of Green Gables so much that I almost ALMOST convinced my then-fiance to take our honeymoon on PEI. We ended up going to Mexico (not a bad second) but someday I will visit and walk the White Way of Delight and dip my toes in the Lake of Shining Waters. I'm reading the secret keeper right now!!! It is both awesome and super slow in some parts all at the same time...if that makes any sense. My friend read it and recommended it and said you just have to keep chugging along because the last few chapters will blow your mind. So alas...I await my mind being blown. I just wonder what you put your kids through to get this posted. Plus, reading books?! HOW do you make time for that pray tell?? And this is not all rooted in jealously...no, not a bit. Will have to check out Jenna's tutorials because I got an embroidery bug before Christmas (so random) so I actually went and bought embroidery floss and started researching tutorials and now I have visions of embroidery dancing in my head ... Now just to get around to starting. 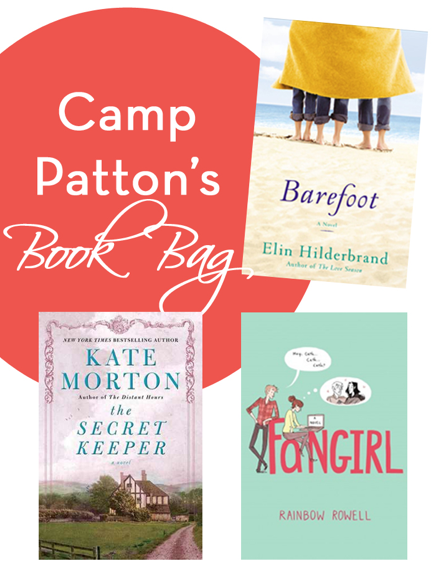 I haven't read "The Secret Keeper" but read "House at Riverton" by Kate Morton and LOVED it. She's a fabo writer. so I'm hearing!! I'll have to get on it asap!! 1. LOVE LOVE LOVE books by Kate Morton. Haven't finished The Secret Keeper yet but they are SO GOOD. Anne of Green Gables is the best. I reread the whole series every time I'm nursing a newborn. Then I covet the way the Blythes had Susan Baker to live with them and help cook and clean and take care of kids. Anyway, I really came to comment because I am the only other person (well, Paul too) in the "not-crazy-about-Harry Potter" club. I read the first… three? books I think, when I had the flu over Christmas one year in college and was sprawled on an air mattress in my sister's front room, but they didn't interest me enough to finish the series or go back and re-read them. And I do like some fantasy-type books, at least ones like that that are sort of based in reality with a dose of magic/mysticalness/etc. We did see a fair amount of the filming locations whilst in GB just because they used a lot of sites, although we didn't do the studio tour or anything. And we saw Daniel Radcliffe in Equus on Broadway. He was exceptional. But anyway. Longest comment. About very little. Welcome to my brain. Soooo what-er-ya-gonna stitch? Make sure we all see pictures now, ya hear? Not that I needed more proof but it was excellent evidence that I was marrying the right guy when he suggested that we go to PEI for our honeymoon. It Was Awesome! Thank you, Grace. We appreciate the prayers so much.